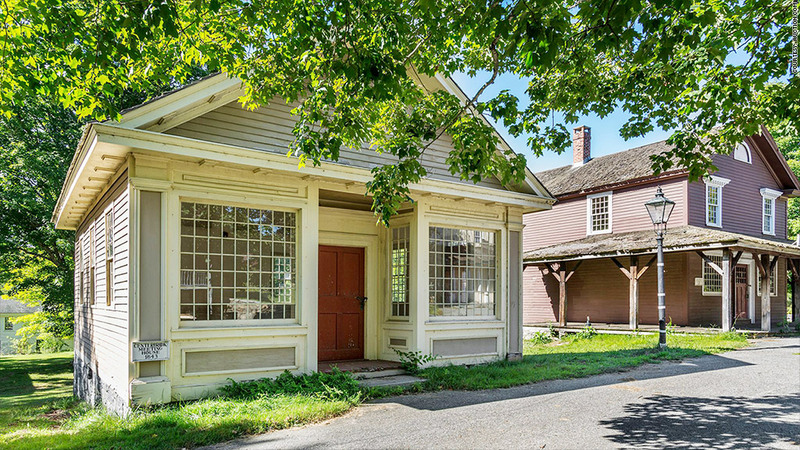 Ever dream of owning your own ghost town? On Tuesday, October 28 -- just in time for Halloween -- you'll have your chance. That's when Johnsonville Village in Connecticut will be auctioned off by Auction.com. Starting bid: $800,000. 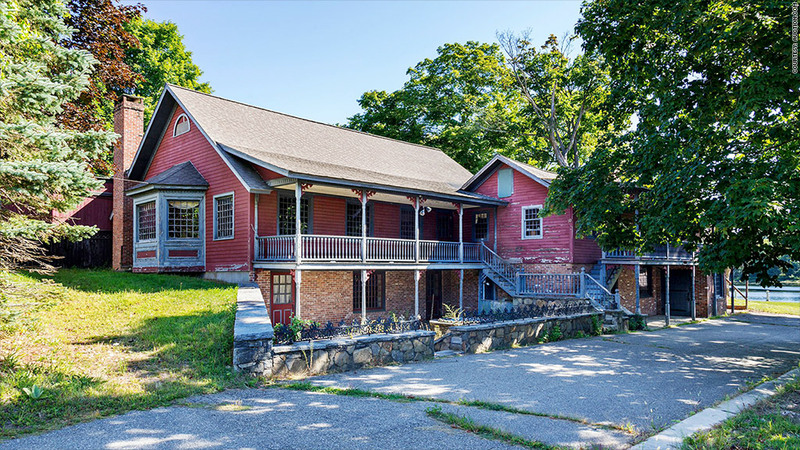 The auction price includes eight buildings -- among them a general store, a stable, a chapel, an old mill and a tavern -- on 62 leafy acres of land. The property is about a half-hour drive southwest of Hartford. Town father Emory Johnson called this 1842 mansion home. The town is named after Emory Johnson, the former owner of a spinning mill at the heart of the town where fine cotton twine was once made. Eventually, however, the mill succumbed to modernization and closed. In the 1960s, the mostly abandoned town was purchased by aerospace tycoon, Raymond Schmitt, who wanted to turn it into a tourist attraction. 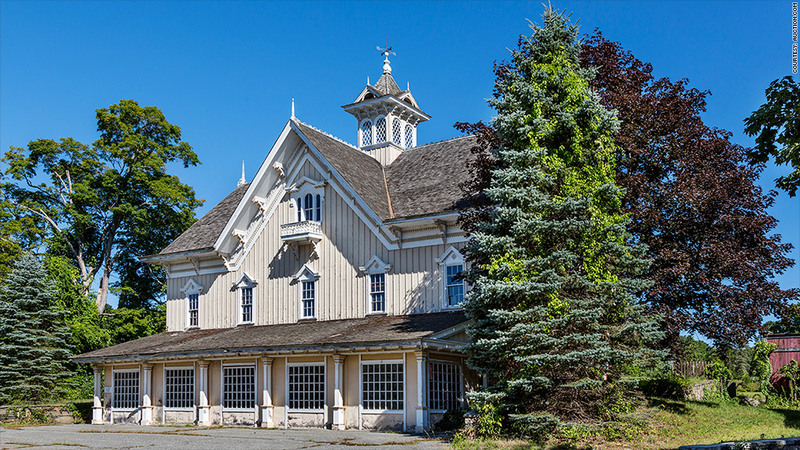 The old stable is topped by a fancy square cupola. Schmitt restored some of the buildings and shipped in others -- including the stable and chapel -- to recreate the look and feel of a 19th century Connecticut mill town. 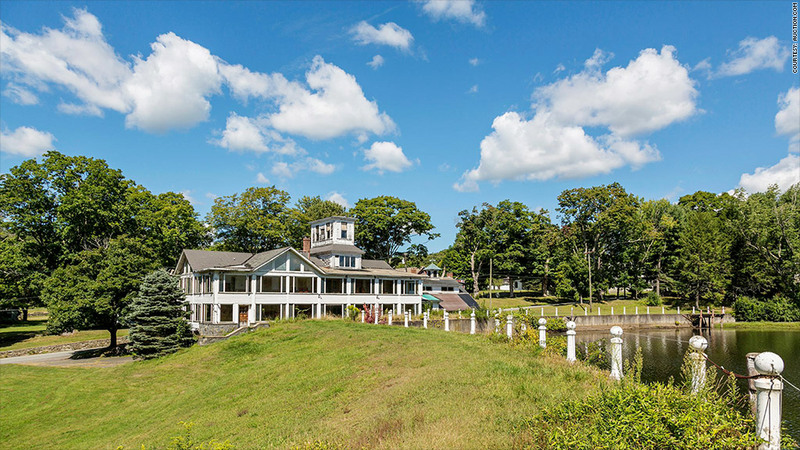 The property now includes the Johnson's original Italianate mansion, a covered bridge, a tavern and other houses. 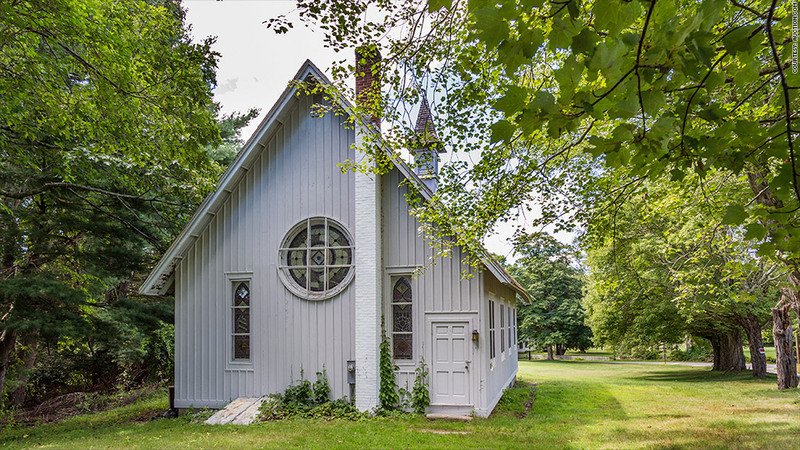 Under Schmitt's stewardship, couples said their wedding vows in the picturesque chapel and Billy Joel shot his "River of Dreams" music video. More recently, a movie, "Freedom," with Cuba Gooding Jr., was filmed with the town as a backdrop. Billy Joel used the chapel in his 1993 video "River of Dreams." After getting into a dispute with town officials of nearby East Haddam over congestion and zoning issues, Schmitt never finished the restoration. He then abandoned the project around 1994 and died a few years later. The town has stood empty since. Although some say Schmitt's ghost still haunts the grounds. Fine twine for fishing nets was spun in the town mill. "The rumor is he loved the place so much that he never left," said Rick Sharga, executive vice president for Auction.com. His heirs have sold off hundreds of artifacts that Schmitt had collected, including carriages, furniture, trolley cars, and a paddle wheel steamboat. The town buildings and land were sold to a hotel developer in 2008, which planned to create a resort and senior living facility. But that never panned out due to a lack of infrastructure like public sewers and water service. A tavern hosted wedding receptions when former owner, Ray Schmitt, ran Johnsonville. Since then, the vacant buildings have been watched over by a caretaker. They are mostly structurally sound, said Jim Kelly, the real estate agent with RM Bradley Company in charge of showing the property. There's wear and tear, however, with peeling paint, roof damage and sagging joists. "New England winters will kill you," said Kelly. 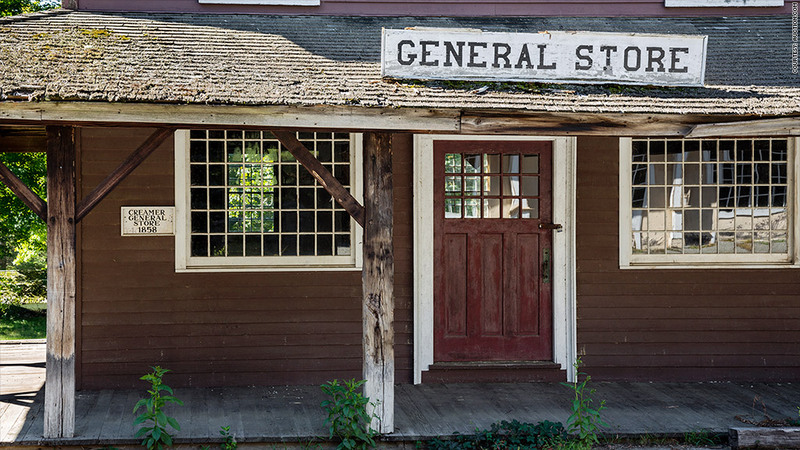 Some buildings, like the general store, need work. He said he doesn't buy into the supernatural, hocus-pocus although a couple of recent incidents -- one that left a reporter with a twisted knee when she fell off some stairs and another when the long-time caretaker stepped on a nail -- gave him pause: Were these just everyday accidents that happen when people trudge around in decaying buildings? Or is Schmitt's ghost trying to sabotage the sale? Water from the pond powered the old mills. If it's the latter, it's not working. 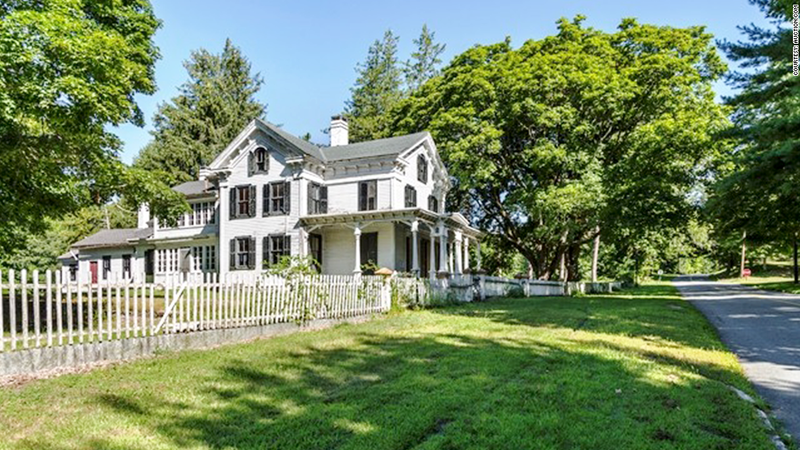 At a minimum opening bid of $800,000, few bidders will be scared off by the price of this prime Connecticut real estate. And Kelly counts more than a dozen "serious" buyers, who fall into three main categories: Those who want it for a private estate; those who want to put in more housing; and others who want to establish it as an entertainment facility to shoot movies and such. The winning bid will likely come in a lot higher than the starting bid. 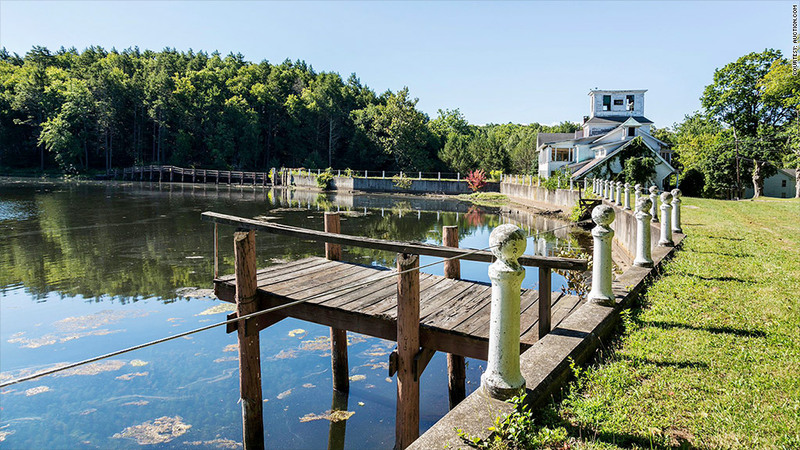 After all, the town was on the market last year for $3 million. There is a reserve price but it's unpublished. The auction will end at 1 p.m. Eastern on October 30th.